Another honor for Pamela Irvine, president and CEO for Feeding America Southwest Virginia. The Feeding America national organization honored Irvine last week with the “John van Hengel Award” for excellence in leadership, local impact and other benchmarks. 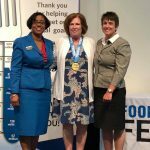 Feeding America also picked up the “Food King Feedy Award” from Food Lion corporate yesterday; the southeast-based grocery chain donated $350,000 towards the Community Solutions Center that will open in northwest Roanoke later this month.